Prague Powder (Cure) No. 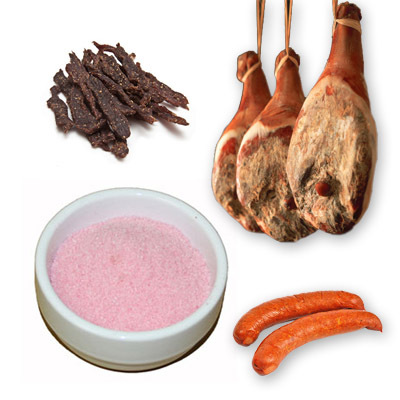 1, also referred to as "pink salt", is a basic cure that is used to cure and control bacterial growth during the longer time that meats are cooking, or smoking. This includes poultry, fish, ham, bacon, jerky. This cure will not work with a traditional dry curing method as your product must reach a temperature of 135 degrees F. to activate it. Prague Powder #1. or InstaCure #1 contains salt and sodium nitrite (6.25%). Use 1 level teaspoon per 5 lbs. of ground meat. Use one ounce per 25 pound of meat. 1/4 lb. or 4 ounces will cure 100 lbs of ground meat.